Posted at: 11/22/2010 10:06:00 PM . The Feed it Forward promotion allows you to send your friends and family free $10 gift certificates through Restaurant.com. Feed It Forward™ is a free way to build community and lift people's spirits by giving the gift of $10 Restaurant.com Gift Certificates. Simply let us know who you want to give to and we'll take care of the rest. 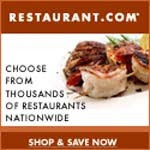 You can give up to 40 $10 Restaurant.com Gift Certificates every day through December 31. It's a great holiday gift for everyone on your list. And the best part is - it's FREE!